ST. GEORGE – Fires burning in a part of Bryce Canyon National Park have grown to over 1,100 acres as of Friday morning, leading to the closure of the park’s main road at the Fairview Point outlook. 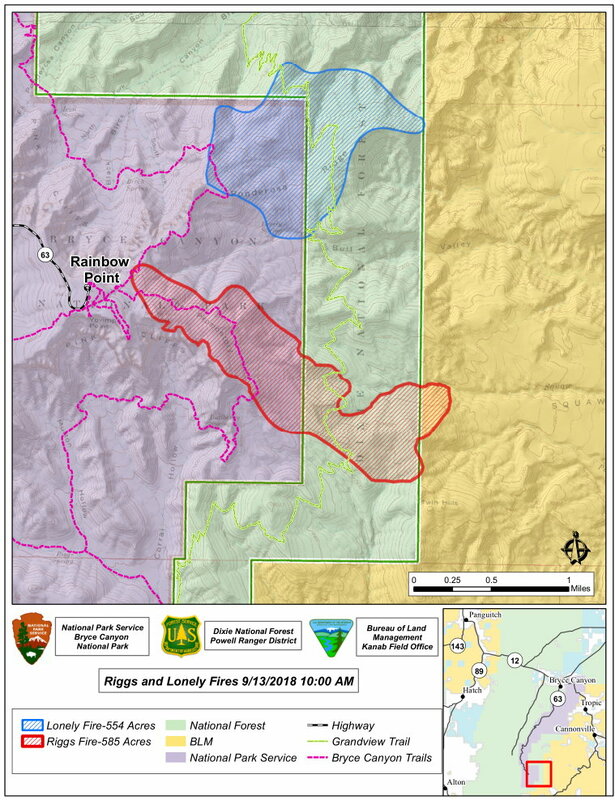 The Riggs and Lonely fires have grown to 587 acres and 554 acres respectively and are spread across a part of Bryce Canyon National Park, the Dixie National Forest and public land overseen by the Bureau of Land Management’s Kanab Field Office. A part of the fire has burned toward the Rainbow Point area where firefighters have set up a sprinkler system to help protect park infrastructure and communications sites should the Riggs Fire continue westward. They also installed a hose lay that they used for a burn out operation, a fire suppression tactic used to remove unburned fuels between an approaching fire and a designated fire line. In this instance the fire line is the Bristlecone Pine Trail, from which hotshot crews conducted a burn out operation in a fuel break area that’s been created over the past three years. The fuel break and hose lay allowed them to conduct the operation and help secure the western flank of the fire. The main road through Bryce Canyon National Park is closed at the Fairview Point overlook due to increased fire activity and firefighter operations in the area. The rest of the park is open to visitors with the exception of associated trail closures. Grandview Trail from the Willis Creek junction to Lower Podunk. Riggs Spring Loop Trail, including the connector trail from Riggs Springs to the Grandview Trail. Under-the-Rim Trail – closed from Agua Canyon to Rainbow Point. Main park road is closed south of Natural Bridge. The Riggs and Lonely fires were both triggered by lightning.